Have a little blockbuster movie fun with the kids at the next free Lowe’s Build & Grow Clinic. 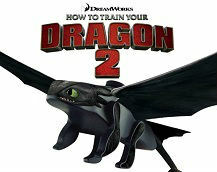 Your child can make the Toothless dragon character from the new movie How to Train Your Dragon 2 for free at the Lowe’s Build & Grow Clinic. The free workshop will be held on Saturday, June 14, 2014, at 10 a.m. at participating Lowe’s stores. Each workshop runs about an hour and is geared toward kids in first through fifth grade. Many of the projects are completed in much less than an hour. My boys have gone since they were four and they do fine with dad’s help. They always have a blast at these workshops and it’s fun to see how proud my boys are of their projects!! Can’t make this workshop? Check out Lowe’s Build & Grow to see what other projects are being planned.